Pneumonia is the leading global killer of children under five. Pneumonia is the leading global killer of children under five, responsible for almost 1.6 million deaths per year, which is about one-fifth of all paediatric deaths around the world. Like other acute respiratory infections, pneumonia targets the world’s most vulnerable children—those who are poor and mal/undernourished. The burden of pneumonia in the developing world is nearly 10 times that of developed world In low income countries, pneumonia kills 7320 out of 100,000 children below 5 years of age, as compared to just 34 in developed countries. In South Asia and Sub Saharan Africa 21% of all deaths in children are due to pneumonia. According to the Acute Respiratory Infections Atlas 2010, lack of food contributes to 44% of deaths from pneumonia in children globally. The prevalence, of childhood pneumonia is very high in India, and claims the lives of nearly 43,000 children every year. Proper nutrition is crucial to supporting the body’s natural defences, and in helping to reduce the effects of a disease once it is contracted. There is a general consensus amongst doctors that malnutrition makes children immune suppressed, thus making them an easy target for a host of diseases, including pneumonia. Although poverty does lead to under nutrition, sometimes lack of knowledge about cheap but nutritive food items also prevents parents from providing a proper diet to their child. This is particularly true of urban families where processed and fast foods are becoming an integral part of children’s daily diet. It is not uncommon even for urban slum dwellers to opt for greasy, fatty foods instead of the simple and highly nutritive, dal-roti. Dr. Dinesh Chandra Pandey, a Specialist in Paediatric Medicine at Nelson Hospital of Paediatrics and Neonatal Medicine, said that till some years back pneumonia was less prevalent in affluent homes as compared to poor families. But protein-energy malnutrition, overcrowding, indoor /outdoor pollution and life style changes are taking their toll in the upper strata of society as well, where incidences of pneumonia and diarrhoea are on the rise. He lamented the popularity of fast foods which are poor in qualitative nutrition and are making children not only malnourished, but immune compromised also. So, pneumonia is no longer confined to poor households alone, though in developing countries like India, the incidence is higher in low income families. Inadequate nutrition—in utero, during infancy, and early childhood is closely linked to lifelong immune deficiencies and acute respiratory infections like pneumonia. Inadequate maternal nutrition is also a major risk factor for later childhood pneumonia, as it is linked to low birth weight. Suboptimal breastfeeding also increases the risk of malnutrition and vitamin deficiencies in the infant. Improvements in health care and nutrition are interventions that can significantly reduce the incidence of pneumonia. According to the Acute Respiratory Infections Atlas, 2010— broad and integrated commitment on the part of the international community to improving living standards worldwide is the true foundation of prevention. 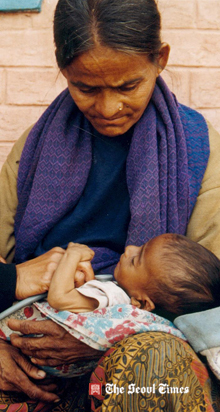 With a view to improving nutrition and increasing immunity against pneumonia and other diseases, the World Health Organization stresses upon exclusive breast feeding till six months; breastfeeding and complementary foods until two years of age; and thereafter an access to nutritional supplements and a healthy diet. Rising food prices over the past few years have added to the woes of malnutrition. At the time of writing this article, food inflation in India was at an all time high of 9.13%. It is imperative to have commitments from governments to combat malnutrition at the community level.